Friday Fun Food: Sugar Cookies! Wordless Wednesday: As Big As I am! Little Spanish Pinay's nanny made an interesting comment before they went out for a walk this morning. She said: "I can never understand those moms I see in the park." She said this with a strong ridicule in her voice. Surprised, I asked why. She said: "Those moms that follow their kids everywhere carrying spoon with food and pleading for them to eat. They tick me off. Can't they just leave their child alone and let them play?" I kind of hesitated whether to respond something or not but I felt that I should in defense of moms. I gues it is easy for other people to judge what moms do for their kids but if they only know how to widen their understanding about different situations, then there'll be no room for a bit harsh comments like this. 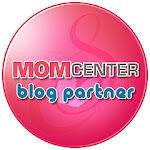 If I am a mom of a picky-eater or a no-eater, I know for sure I'd do ANYTHING just for my child to eat something except push or force them to eat. If following them everywhere she goes in a playground with the food in my hand would make them eat even just a little bit, I'd do it. If cutting vegetables into interesting shapes would make her eat them, I'd do it. If singing and dancing in front of her while she eats will make her eat her portion, I'd do it. ANYTHING. That is, any trick I can get my hands on. No forcing as I don't want her to relate eating as a negative experience - that'll just make things all the worse. Eating should always be fun! I've heard of advices on just letting the kid and have them just come to you when they feel hungry because they would anyways. While this is true, there are still cases of kids that can even pass hunger by just drinking water or juice. With a little more effort, we as parents can do certain things to encourage our kids not just to eat but to eat healthy and if there is something I can do, I'll do it. Fortunately, I don't really catergorize Little Spanish Pinay as a picky-eater - she does eat a good variety of food. But I still would love her to learn to eat more varieties of vegetables and fruits. Most especially, I'd like her to learn to eat fresh apples, grapes, oranges, baby carrots (she eats cooked carrots), etc. No matter how we tried, she never liked apples. It would also make me a happy mom is she eats a little bit bigger of a portion. Right now, I do not worry much (like my level of worry is about 6 out of 10 being 10 as the highest) because she still nurses and I know that the breastmilk gives a very good compliment for her current diet. But the moment she stops nursing though and the amount of food she takes daily would still be like how it is now, I definitely would start to worry more. One day though, while we are in a play date, my friend's daughter D (4months younger than LSP) started to eat her snack. She was eating grapes. I was amazed because she eats it like them alone (peeled and seedless) without fuss. LSP was never really fond of grapes but when she saw D eating grapes, she started telling me she wants grapes too. My friend gave her grapes from D's plate. LSP put one in her mouth, made a face but chewed and swallowed and asked for more! I was ecstatic (but enbarrassed at the same time because LSP is robbing some snacks from her playmate). My friend gave some more grapes to LSP and she happily ate more! 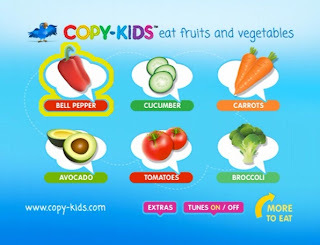 I realized that kids seeing other kids eat healthy food is contagious because kids love to copy! Especially toddlers. I thought back then that if I can only borrow my friend's daughter every meal time, it would be really great. But of course, that can't happen. Until I've discovered Copy-Kids Eat Fruit and Vegetables DVD. So, all you moms (and dads) out there especially those with picky eaters, read on! It is a compilation of videos of kids eating different fruits and vegetables. It is a genious idea, really. When I got a copy, I immediately watched it and was so engrosed with the cute toddlers in each video catergory. The videos are unscripted. They're just like normal home-videos of kids taken by parents but with high quality. It's like that part of Modern Family where each member is interviewed minus the script. I love the spontaneity and quirkiness of the kids, they literally made me laugh out loud everytime. Side note: I definitely love kids and watching the video, made me dream all the more of having my own daycare. Additional bonus is an interview with renowned pediatrician Dr. Jay Goron, MD, FAAP, author of Good Food Today, Great Kids Tomorrow. He answered each interview question with short but very informative statements. Nothing boring. I popped in the DVD, watched it for myself and finished the whole 115 minutes in one sitting! The Outtakes (spoofs) video will also make you laugh and want to pro-create again because of these kids' cuteness LOL. I did! Made me want to eat those kids in the video. My husband kept asking me what was I laughing about. I made him keep guessing :-D He couldn't come over to see because he was working haha! (Of course later on I told him what was I laughing about.. I am not super evil). 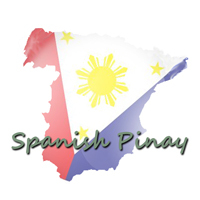 The following day I tried it on Little Spanish Pinay. To be honest? I was kind of hesitant about it. I have a fierce child and when she says she doesn't like something? There is no way in the world you can convince her to say otherwise. So ok, we started the "trial" video watching. I peeled carrots, cut them in small portions (I didn't have baby carrots so I just used the normal ones... next time I promise to buy baby carrots). and put them in a small plastic bowl. When she saw the kids, her face lit up (she loves kids). The DVD menu is composed of different fuits and vegetables. I clicked on carrots. 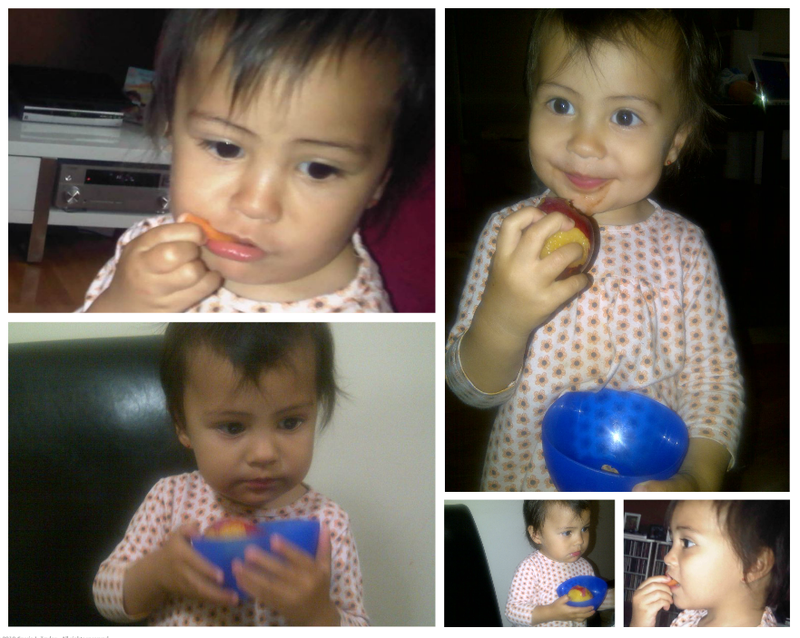 With a super animated voice, I started telling her look how Mattea is eating carrots. She loves to repeat the names of teach kid being shown in the video. Then I told her, oh wow, LSP has carrots too... look! She smiled, picked one carrot, the continued watching with an amused smile on her face. OK, so the result? She started eating the raw carrots! Not just once, but she repeated when she was done with the first one. I was ecstatic. Later on in the evening, I tried another fruit. I only have plum in my ref (as well as pear and bananas but she does eat both so I had to try plum without pealing them), so I washed one, and put it in a small bowl. Plum is not included in the list of fruits in the video but I figured if she sees the kids eating, she'll want to eat too so whatever she'd have in hands might do. I was right. She ate the whole thing. Peel included! Funny thing is that she not only copied the "eating" but also some cuteness that the kids in the video do. This Kid Audrey is too darn cute. In one of the videos, she was covering both of her eyes and then counting silently like as if she's playing hide and seek. Later at night, when I was putting LSP down to sleep, she started doing what Audrey was doing. It is amazing how kids copy! Wait, Copy-Kids has been kind enough to give another copy of their DVD to one of you! Enter to win!!! Glad that you got your copy of Copy-Kids and your girl liked it too. any vegetable. my son is picky eater and i can really relate on your nanny's story. i'm one of those mothers, hehe! I sometimes do that too! May days na non-eater ang aking anak so pag ganyan, habol ako sa kanya ng habol para subuan hehe. i would like my kid to learn to eat squash. but it would be better if he will eat all kinds of vegetables. Hi Christine! Thanks for joining. I'm sure your kid will learn to eat veggies in time :) Good luck! Well, I hope mitchi will read this post of yours very soon. Because her son Ethan is very picky with foods. I remember nong baksyon ko don, everytime he eats ay ang saya saya ko, kasi hirap talaga pakainin. Maybe this dvd will do the miracle like with you sweet LSP. I don't have a kid yet, but I can use this strategy on my little sister who's 3 and mahirap pakainin. Pasta lang ang gusto, or ramen, basta kahit anong noodle-y ang itsura. This is brilliant! I won't categorize Kelly as a picky eater since she eats anything. But, I can say she is a very lazy eater. When she sees a toy, she'd stop eating and start playing. I guess if she sees other kids eat, she'd make time for meals (sana!). Waaah! I can't find the link :( it directs me to another giveaway, which is, Herbal Water. OMG, my child is a picky eater. she doesn't eat rice. she only eats chicken, pizza, banana, mango, and bread. i hope i win this. i would like my daughter to eat more fruits like apples. Hay, about your nanny's comment - ang hirap no? Ang daling magbitiw ng comment pero you just don't the circumstances. Poj goes to nursery and I know that he eats better there, I know coz Ive seen him eat away when he's with his friends. And if he's in a playgroup with someone who is a picky eater, I make sure I put in a bit more attention to his eating in case ma-sway sya into not eating na rin. As a mother of 3, grabe iba iba ang attitude nla when it comes on eating habits but one thing for sure, parepareho silang pihikan when it comes on fruits and veggies na kakainin nila..Piling pili lang ang gustong kainin. But ofcourse i want them to eat all fruits and veggies available in the market as much as possible, like watermelon, guabanos, pineapples, papayas etc. I hope to win the DVD, it will really help me alot in introducing them to eat fruits and veggies. tnx. My daughter should learn to eat all kinds of vegetables so she won't grow up hating any of them.